So my dad uses a lawn care service to keep the lawn mowed, what with him being 83 and all. He's been complaining about the half hearted, rushed job they do for a while. Apparently, this year, they didn't even try. After an initial cut, they didn't show up for a few weeks, using train as an excuse, leading to a cousin from the city for weeds, and long grass, the first time my dad got one of those in 40 years of living at this address. The service showed up on thepast weekend and for some reason, cut just the front yard. Not the back yard. Not even the sides of the house. A call on Monday elicited a promise to come by that day, which didn't happen. A call on Tuesday elicited an insistence that they had come by on Monday and done the job, which was infuriatingly and blatantly untrue. Etc, etc until this morning, where things were taken into own hands. Now, my dad's lawnmover has been rusting under the deck for a long time, and it's probably not safe to use, so we made do with a weed whacker and a old school motorless push mover. The latter didn't last long. Between the blades not being that sharp, the wheels clogging up and not spinning every few yards, and the thing being deceptively heavy, I'm going to be feeling my shoulders tomorrow, if not sooner. So, weed whacker it was. And I started working wearing Crocs, an unfairly maligned piece of footwear. I seriously don't understand the jihad people feel they need to wage against comfortable shoes. But then a twig or a little stone got kicked back by the whacker onto my add-in and drew a bit of blood, and I decided I needed some semblance of protection against any further such incident. So I went in, and grabbed socks longer then I usually wear. And then I went and put those Crocs right back on my feet. And I went outside, where people could see this crime against fashion and/or humanity. And now I'm sharing the sight with you. You may want to avert your eyes if you're squeamish about this sort of thing. (On the plus side, I got some darn good exercise out of it. 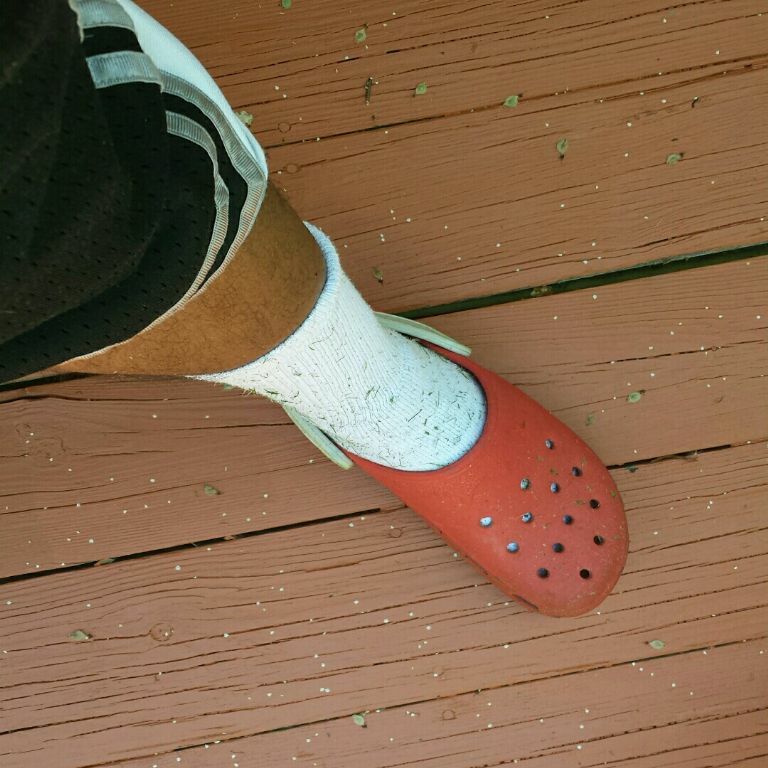 Yard work is no joke). tried them but my feet hurt. Yes the old push mower. Mine would jam and rock up in the air. Would have to pull it back, un- jam it and try again. Now we do not have grass. Desert sand covered with pea gravel. Hahaha....I can’t stand those things but I am surrounded by them in my family. When my grandkids wear them they are constantly tripping when running (fair warning). My DD asked for a replacement pair for Xmas and I just couldn’t do it. Although I wish my dear man would get a pair for gardening so he would stop tracking muck in. Is that the only landscaper around? We have so many around here! LOVE my crocs! No negative words on that from here, that's for sure. Oh . . . . my . . . . gosh. We had a lawn service for one summer. That was e-n-o-u-g-h. Same experiences. Forgetaboutit. Now we get the exercise and are none the worse for the wear. I sure can understand that, with your Dad's age, that would be difficult to do it himself! Sorry you had to go through this but it paid off with good exercise.